This alone is enough to have them arrested…I heard the prison term for this in 20 years or life. Will it apply to them as well? You know we have biased police and a kangaroo justice system. They never arrested and prosecuted any from aluthgama incident, gintota, ampara. Do you really think this will ever happen ? cmon brother, many have even clearer versions of it.. But what is the benifit. At Akurana my friend told, the STF were the ones who initiated it.. so?? We have seen this soooooooooooo many times in the ‘riots’ against Tamils!! Where is the chivalry in young men going in large numbers and attacking women and children cowering in fear in their houses? A Culture of Impunity for Hate crimes and Financial Crimes and the Mahinda Rajapaksa criminal family has been put in place by Ranil Wickramasinghe and his boys in the past 3 years of a-yahapalanaya. RW the Minister of law and order is Pujith IGP is his boy, just like Arjuna Mahendran. Because of the massive corruption and failure of Law and order process in the past 3 years people have not faith in the system and taking law into own hands. Ranil Bond hora must get out! The caption should have said “SINHALA BUDDHIST EXPOSED IN BUDDHA”S HOLY CITY OF KANDY”. I think colombo telegraph shouldn’t become channel 4, This is clearly an old video…. We are blaming facebook for spreading propaganda videos and news and here CT does the same. And I think muslims shouldn’t hand him over to police, Sinhalese should. But muslims have some people who should hand over to police too. Those Quatar funded extreamist organizations in Maligawatte. If both Muslims and Sinhalese can control their own racists, On that day Sri Lanka will become prosperous. Otherwise we will be just pointing fingers at each other and fight. Is this another smoke screen? Prevention of Terrorism Act, anyone? Is our IGP aka Drama Queen Pujitha J still meditating at Police HQ in Colombo? He is too busy being a good Sinhala/Buddhist. What made you think he is responsible for internal law and order issues? The IGP is being employed to manage events for the benefit of crooks, crooked politicians, crooked state functionaries, crooked saffron clad thugs, and crooked policemen because he benefited from crooks in the past, otherwise he could not have reached where he is now. This is an old video from a previous attack. I’ve seen this video before. Nothing new in this. If it is old news, why did you show it to the police? Also, if this is an old video, why are they talking about the Ampara riot when it only happened a week or so ago? Nice try. The trolls are already trying to downplay this. Old or new this is an evidence, but this gov not gonna arrest this guy. Muslims made a big mistake they supported with the govt and Sinhalese when the attack was against Tamils. Now they are paying the price. Its not late to learn from your mistakes. Muslims don’t have an issue of defending their land as they are scattered all over the country and the government too cannot carpet bomb like they din the north. Only thing Muslims have to think of is to defend themselves. There are enough men Sri Lanka trained as home guards and without crying for help from politicians they should look at their neighbor and ask for help from MULTA. Not so. He cleverly distracts people by indefinitely postponing violence. Clever move. This is an army matter. People should not fight against ISIS. Let the army do it. There is a man call Dilrook K. who have incited hatred against Muslims from abroad. He confirms Muslims gave ‘wanda pethi’ to the Singhalese. Using social media he made hatred to us. Authorities must take action against him. Thank you Shfan 4 making people aware of it. Why should CT publicize without clear knowledge of vital facts. BS: Age of the tape does not matter. Arrest all those that could be identified, charge them and throw them in jail. Remember these is the same country that arrested JS Tissainayagam, kept him in jail for six months without bail, tortured him then charged him under the kangaroo court and sentenced him for 20 years RI. All this was for writing two articles in a magazine no one reads and that too not inciting violence. Watch BBC worl news for update. CT doesn’t say they have forwarded this to the law enforcement authorities. Have they done it? Are they interested in maintaining Law and Order? I doubt it. They want chaos to advance their project to divide Sri Lanka as do the so called International Community, racist elements of the diaspora and the backstabbing India. Aren’t we discussing the enemy within, people like you, the so called Sinhala/Buddhists, the Sinhala/Buddhist fascists, the noisy minority, the Spuristas, in this forum? I think you must be very tired now typing the above therefore come back in a years time to give your two cents worth analysis. Look forward to reading your typing. Colombo Telegraph, please verify your news before posting, otherwise you end up ruining your own reputation and looking like fools.
! but most Sinhalese brothers don’t know, and it’s pointless because even after handing over to police no action is taken. If CT is so keen on revealing these truths then why not bring this up when it happened? If you want i can provide 100s of links, all on youtube, to many similar videos. Muslims should join the Tamils and protest all over the world. It’s time for minorities to unite. Certainly it would not happen as their is no congruence in their aims. Muslims ‘generally’ are driven by religious ideology and expansionism through numbers, whereas Tamils want their political rights secured. So Tamils lose Modi’s support? Read what Modi is doing to Muslims in India! I still think Tamils should go it alone. Muslims were with the abuser when Tamils really needed help. Joining Muslims will label the issue as “Islamic” and the is a very bitter pill in most developed nations. then how come say Kandy?? CL already said that they can not confirm the date.by the way you said this is an old video.can you confirm that please?? Pls take all necessary steps to take legal action against him on behalf of all good people. Thanks ct.
A message from Korea. I’m Korean and I was about to introduce my products to Sri Lanka market. However, for now, my muslim friend and his beloved family are in danger. Also my business has been stopped because of the violence. Last month, I and my muslim friend were talking about our future abundance but now he is worrying whether he and his family is safe or not. I do hope that the religious leaders in Sri Lanka lead the people to the right way – love and peace. Old video. CT is taken for a ride by someone. I don’t mind taking the ride along with CT as I haven’t seen the clip before. This is an old video not a new one. Please check this and verify. 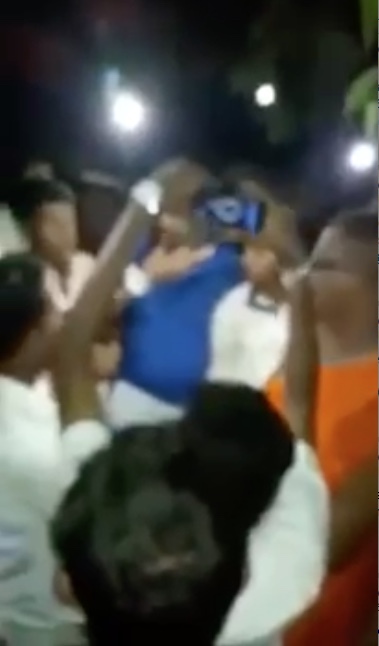 This video was broadcasted MORE THEN ONE YEAR AGO, live in Facebook page of Bodubalasena, (WHICH IS BLOCKED NOW), while Gnaanasara Thero was stopped by the police during the travel to Batticaloa. Don’t spread misleading video footages on this tense situation. ColomboTelegraph we believe your News informations are TRUE. When we have a proven strong person who can handle such issues is available President does not want to appoint him (Sarath Fonseka). That is because Mahinda Rajapakse and the President at the midnight meeting agreed not to do so and this view was supported by the leading business person. Why is the President so weak? What did he prove apart from he being a determined killer and a public racist? They say government is lukewarm about taking action.? Why is this government sponsored?or gnanasars they say he is sponsored by the west?who knows!,!We had these episodes before! Mahason Balakaya Leader and BBS Gnanasara are well past the plotting stage. They are talking how to share irresponsibility. CT do you have proof of this clip taken recently? Are you fooling the people or are you being fooled? NO, CT is Sinhala and Tamil christian and muslim. that is why. Is this video from Mahawamsa? hang the sob. monk should be cut to pieces. ..This Is quite An Old Video Clip……..Not A Recent One………Do Not Play With Fire………Mahasohon And BBS All Are Sinhala Resistance Movements……………….When The Ex-VP The Butcher Was Alive Why Did Not ANYONE Try To Get Some Video Clips From That End And Show Us ……….I THink People MUST BE EXPECTING the sinhalese people To Give Their A-S off Without Reacting to Extremists ATTACKS that they are working out………….This cannot be continued…….All these extremists should be taught a good lesson which they shall get from nature………….Isn’t that your column readers educated to understand the Well planned set up work of these extremists and terrorist diasporas targeting human lives to divide this country…………..with the assistance of UN human Rights Group ……. I think no problem at all it is an old video or new one. Issues is if it is an old video whether the action has been taken over this instigation and piloting of riots. If action would have been taken taken and arrested them, we would not faced the presence situation. This one year old video and this post is a testament to the intelligence (or the lack of it) of many of the uneducated fools of this forum. Anyone with an ounce of intelligence will know Gnanassara thero’s stance on this new violence. He has categorically asked everyone to remain calm. Given that fools have very low comprehension skills his message doesn’t appear to be clear to them. He only sympathizes with the Sinhalese youth who lost his life. yeah! talk about ‘uneducated fools in this forum’. If this is a one year old post how come no right minded person who saw this Video cared to bring this to the notice of relevant authorities to take necessary action to avoid such a well planned plot?? Specially the ones harping they’ve seen this video “one year” back?? for the past 5 years Racial hatred towards muslims is an ongoing problem in Sri Lanka. Which was initiated by Bodu Bal Sena ( Buddhist Extremist group monks) backed by former regime. Muslims have been living peacefully with other communities for decades, as law abiding citizens . As every body know that the culprits go behind the bars for few days and are released because they are backed by politicians and monks. This is due to law enforcement favouring the majority Buddhist of the country. There is no end to this problem until proper action is taken against this Extremist Buddhist groups..
is a Buddhist country,and as muslims we do not need to proliferate intentionally.In addition with that there has been numerous rumors about this topic as well.If sinhalese people have problems with Muslim people,there is process of solving them.Vandalizing all homes and Mosques is not the remedy for that.It is totally fake that muslims are conspiring against sinhalese in srilanka.Therefore we need harmony not racism.Above all,we all are humans.Being born as humans why we need casts and creeds.I cordially invite all Buddhist,Sinhalese people,please do not bamboozle to these fake people and pitch in to defend the nations’s harmony. The title is misleading. If you watch this video carefully you can see that Amith Weerasinghe asked people not to attack. At least we must admit that he tried to calm people by saying the legal background. If you want to blame even this, you are the ones who are racist.